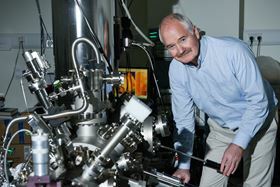 John Boland pictured with a scanning tunneling microscope. Photo: AMBER, Trinity College Dublin. A team of researchers from AMBER, the Science Foundation Ireland-funded materials science center based in Trinity College Dublin, together with colleagues from the UK and the US, have made a breakthrough in the area of material design. This breakthrough challenges the commonly held view on how the fundamental building blocks of matter come together to form materials. Led by John Boland, principal investigator in AMBER and Trinity's School of Chemistry, the team showed that the granular building blocks in copper can never fit together perfectly and so are forced to rotate, causing an unexpected level of misalignment and surface roughness. This behavior, which was previously undetected, applies to many materials beyond copper and will have important implications for how materials are used and designed in the future. The findings are reported in a paper in Science. A material’s electrical, thermal and mechanical properties are controlled by how the grains in that material are connected to each other. Until now, it was thought that grains, which are made up of millions of atoms, simply pack together like blocks on a table top, with small gaps here and there. Boland and his team have now shown, for the first time, that nano-sized grains in copper actually tilt up and down to create ridges and valleys within the material. Nanocrystalline metals such as copper are widely used as electrical contacts and interconnects within integrated circuits. This new understanding at the nanoscale will impact how these materials are designed, ultimately leading to more efficient devices, by reducing resistance to current flow and increasing battery life in hand-held devices. "Our research has demonstrated that it is impossible to form perfectly flat nanoscale films of copper and other metals," said Boland. "The boundary between the grains in these materials have always been assumed to be perpendicular to the surface. Our results show that in many instances these boundaries prefer to be at an angle, which forces the grains to rotate, resulting in unavoidable roughening. This surprising result relied on our use of scanning tunneling microscopy which allowed us to measure for the first time the three-dimensional structure of grain boundaries, including the precise angles between adjacent grains. "More importantly, we now have a blueprint for what should happen in a wide range of materials and we are developing strategies to control the level of grain rotation. If successful we will have the capacity to manipulate material properties at an unprecedented level, impacting not only consumer electronics but other areas such as medical implants and diagnostics. This research places Ireland yet again at the forefront of material innovation and design." This story is adapted from material from Trinity College Dublin, with editorial changes made by Materials Today. The views expressed in this article do not necessarily represent those of Elsevier. Link to original source.